Many consumers are completely unaware that the vast majority of meat available at their local grocery store contains antibiotics that can be harmful to their health. Farmers who raise pigs, chickens cows and other animals for meat inject their animals with antibiotics in order to treat and prevent illnesses. The downside of this practice is that antibiotics remain in the animals tissue and humans end up unwittingly ingesting these drugs. 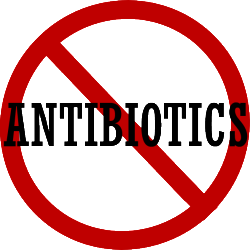 While ingesting antibiotics won’t make you and your family sick, it will result in a resistance to antibiotics. This means that if you do come down with an illness that requires antibiotic treatments, you body may not respond to the drugs and you will continue to suffer. Super bugs and bacteria have evolved so that they can survive the affects of antibiotics, which also makes it easier for illnesses to spread. Proponents of antibiotic free meat argue that by improving the living conditions of animals and stepping up sanitation efforts, farmers can keep their animals healthy without the use of antibiotics. Using these drugs allows farmers to house more animals in smaller spaces and treat sicknesses instead of trying to prevent them in the first place. After all, humans have been safely ingesting meat for centuries prior to the invention of antibiotics. It isn’t that our meat is now somehow safer than it used to be. In actuality, factory farming practices have lead to the spread of illnesses among animals and antibiotics provide a quick fix that is more affordable than providing more space and healthier living conditions. As consumers have become more aware of the benefits of antibiotic free meat, they have responded with their wallets and started supporting farmers and grocery stores who choose to sell antibiotic free meat by purchasing their products. By creating more of a demand, food providers are forced to carry more antibiotic free meat choices on their shelves. If you aren’t sure about whether you have been purchasing antibiotic free meat, all you have to do it read the label. Producers are more than happy to advertise the quality of their meats. While antibiotic free meat can be more expensive, the extra cost may be worth preserving your health and doing your part to change the market. The only way to stop the production of meat filled with antibiotics is for consumers to stop buying it and buy from your local farmers like Dostall Farms in Oberlin Ohio.